A 'Tear Gas' Obstacle is Coming to Tough Mudder, Wait...What? Tough Mudder isn&apos;t playing around anymore. If electric shock devices and rings of fire weren&apos;t enough, Tough Mudder, your favorite novelty race, is now adding "tear gas" to their list of obstacles for upcoming races this year. The Downtown Brooklyn company, which designs these physically and mentally demanding courses, just announced some new elements they&apos;re adding to courses this year, with the most jaw dropping feature being a "tear gas" obstacle. Don&apos;t worry, it&apos;s not actual tear gas, but the sensations are similar. Tough Mudder declined to comment on the ingredients they used to make their tear gas obstacle, but did confirm the name of obstacle is "Cry Baby", at least for now. Austin Murphy, a tried and tested Tough Mudder competitor, recently gave the "Cry Baby" obstacle a run. He told Sports Illustrated the new obstacle invokes the, "feeling of having Sriracha poured into every one of our tiny cuts and abrasions." There&apos;s over 50 Tough Mudder races on the books for 2015, with locations ranging from upstate New York to Melbourne. As of now, it&apos;s not confirmed which race locations will be using the new extreme obstacle. Despite the harsh sounding nature of the obstacle, Murphy fully endorsed the course saying, "Those fleeting tortures are interspersed with, and offset by, moments of gut-busting fun." Tough Mudder is scheduled to announce the latest obstacles added to the course, along with their names on January 13 at the MetroTech Center in Downtown Brooklyn. 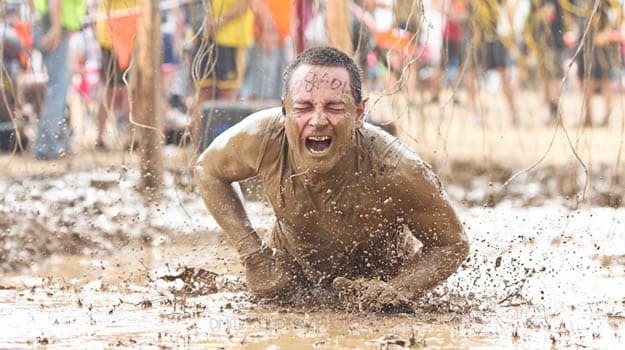 Head over to Tough Mudder for a full listing of events, and let us know if your willing to tackle the grueling "Cry Baby" obstacle, and cross it off your bucket list.